Darfur's arid environment houses refugee camps for 2.6 million internally displaced people in Sudan. Meet Abubakarr Bangura, a UN Volunteer Water and Sanitation Technician from Sierra Leone who promotes South-South cooperation by serving with the African Union/United Nations Hybrid operation in Darfur (UNAMID). With his support, UNAMID helps provide clean water to thousands of people. 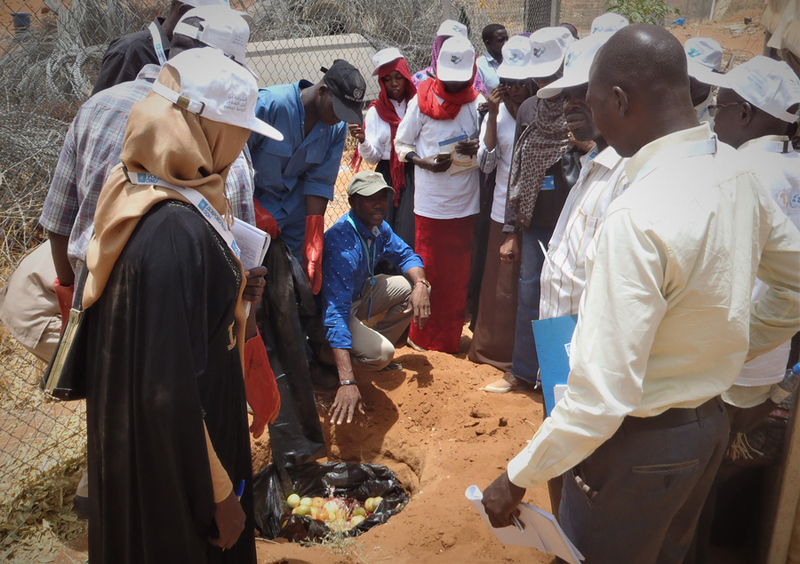 Abubakarr Bangura (Sierra Leone), UN Volunteer Water and Sanitation Technician with UNAMID in Sudan, instructs youth group members from an internally displaced persons camp in Darfur on techniques for small scale composting. For more than ten years, the African Union-United Nations Mission in Darfur (UNAMID) has maintained a large-scale peacekeeping operation following years of civil war. The mission is unprecedented in its ever-evolving nature, due to challenges posed by the harsh desert conditions of West Sudan. The lack of water is one of the biggest threats to peace in Darfur, posing risks of disease and heightened conflict for the vast numbers of internally displaced persons in the area – 2.6 million people, according to a 2017 report of the UN High Commissioner for Refugees (UNHCR) . UN Volunteer Abubakarr Bangura, from Sierra Leone, serves as a Water and Sanitation Technician and is stationed with UNAMID in El Fasher, North Darfur. Abubakarr's degree in Development and Economics, and his current pursuit of a Master's Degree in Environmental Management, made him the perfect candidate to support UNAMID in facing the environmental challenges in the area. Ensuring access to water for the millions of IDPs in camps across Darfur is a monumental operation. Abubakarr helps providing 280,000 litres of drinking water to IDP communities each week, including organising the transport and logistics for water supply to prisons and schools. "I was especially interested to serve and contribute in Darfur, where millions of internally displaced persons are living in a desert environment," he explains. Abubakarr’s also works to empower local communities. To this end, he provides environmental training to youth and women from local camps, equipping them with techniques for small-scale residential composting and waste management. He also carries out community outreach projects that provide tree planting and environmental training to residents. The UNAMID facility in El Fasher houses thousands of UN staff and peacekeeping forces. Another of Abubakar’s key responsibilities is to reduce is the impact on a such fragile environment. UNAMID operates the only modern waste water treatment facility in the country that treats 478,000 litres of waste water each week. The treatment is carried out using clean bacterial agents, in an environmentally-sustainable manner. "Any toxic waste generated by UNAMID could negatively affect the surrounding communities, so we make sure to treat our wasted water in the right way. Someday, we will hand over these premises to Sudanese officials, so we want to leave them a clean and healthy facility," he explains. This article was prepared with the kind support of UN Online Volunteer Erin O'Neill.